Q. Does the PawPrint (PaperCut) printing system store my credit card information? Will I have to re-enter my card number each time? If I add money on a friend's account, will my card number stay attached to my friend's account? Is there a way to transfer funds from my print account to my friend's account? The PawPrint (PaperCut) system does not save your credit or debit card information. Users normally have to enter their card info each time they want to add more credit to their accounts. Although it's a little inconvenient to enter the credit or debit card info each time, it's best to just add a little money at a time. This is because any funds left in your printing account when you leave Chattanooga State (after graduation, etc.) cannot be reimbursed to you. 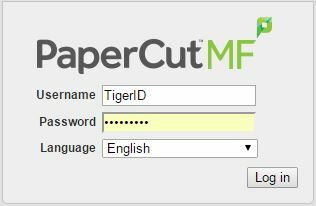 After logging in with your TigerID and password (the same one you use for TigerWeb), look in the menu on the left side and choose Transfers. Amount: Enter any amount up to your Available credit. Transfer to user: Enter your friend's TigerID. Comment: Add a short note if you wish. Your friend can see it by clicking on Transfers in his/her own account. For more information about printing on campus, please go to library.chattanoogastate.edu/studenttechsupport/printing.